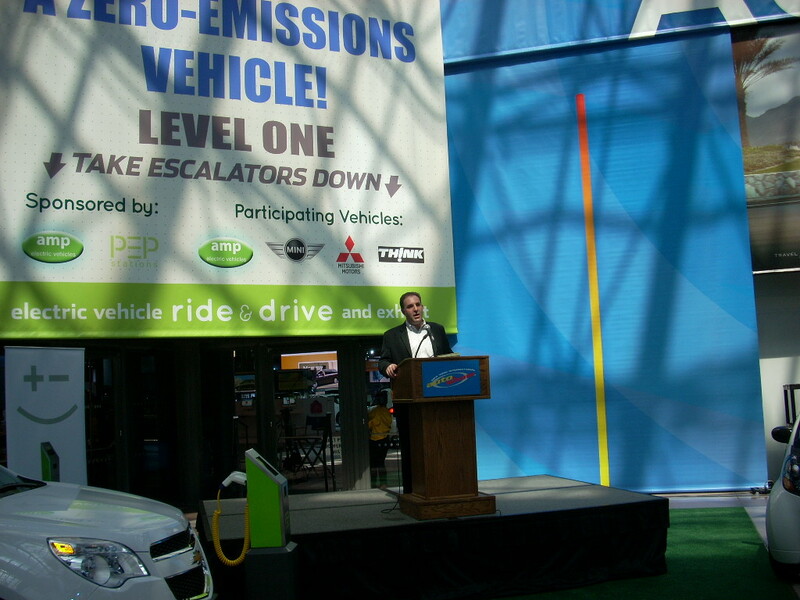 I had the pleasure of attending the EV Press Conference on the second press day of the 2010 New York Auto Show. The event was right after Mitsubishi’s press conference, filled with loud indie rock, light shows, and the big reveal of their new crossover. The EV press event was much more low key, and really a sequence of rapid fire, five minute speeches from five EV companies. Amp Electric Vehicles, Mini, Mitsubishi, Think, and PEP Stations all gave a quick rundown of their vehicles, goals, and innovations. First up was Steve Burns, CEO of Amp Electric Vehicles. Amp does high quality conversions of domestic ICE vehicles to 100% electric drive. The Midwestern team is currently converting the 2010 Chevrolet Equinox as well as 2007-2009 Saturn Sky and Pontiac Solstice convertibles. They brought a converted Sky and Equinox, which were definitely the sexiest looking electric cars driving around at the show. Anyways, Steve Burns focused on the Equinox, a SUV that truly shows that electric vehicles are just as capable as their internal combustion predecessors. The Amp Equinox crossover has a 150 mile range, 90 mile per hour top speed, and a 0-60 mph acceleration of 8 seconds. Burns attributed this exceptional performance to the Remy electric motor. Remy has made over a billion motors of all sorts around the world, and they are bringing their legacy to the electric drivetrain. It is exciting to see established internal combustion companies adapt and apply their expertise to electric drive applications. The Amp presenters suspiciously omitted the price of their Equinox, so I’ll include it here: $50,000, more than twice the price of a 2010 Chevy Equinox. Next up, a BMW spokesman gave a short presentation for the Mini E. He briefed us on the specs for the highway capable EV with a 100 mile range, and “go kart-like handling.” The Mini E is already being leased to select drivers, and he announced they have extended the lease for another year, with over 50% of the leasers renewing. More interestingly, he noted BMW’s Project i. Which will catalyze more applications of electric drive trains in BMW vehicles, like the 1 Series coupe. They already revealed the BMW ActiveE concept at the 2010 Detroit Auto Show. The ActiveE will pack a 170 horsepower electric motor in a 1 Series, to give it similar specs to the Mini E, but lets hope they give us some trunk space. Product Planning Manager, Brian Arnett gave us the rundown on their plans for the Mitsubishi i-MiEV. Sounds like they are pretty far along already in the east, with 1,400 cars sold to Japanese fleets. The 80 mile range highway capable EV will retail in Japan this month. 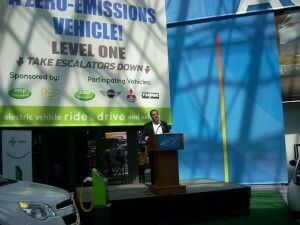 Mitsubishi hopes to introduce the the i-MiEV to the US in Fall 2011. They are already creating partnerships with companies in the US, like Best Buy (Geek Squad cars), and California Electric (for EV infrastructure). John Harmon represented Think North America next. The company plans to begin manufacturing the THINK City in Elkhart, Ind. beginning in early 2011. 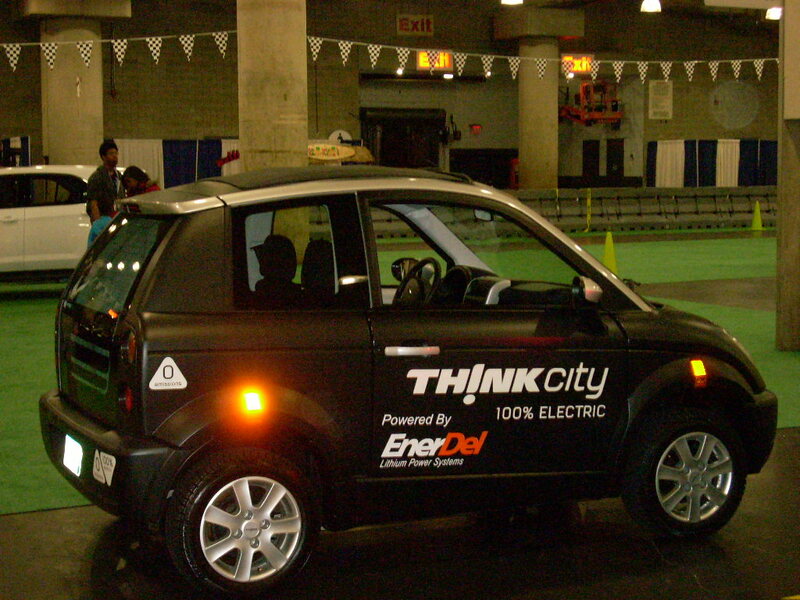 The Think City will have a range of 100 miles, and a top speed of 70 mph. The two seater also has a large cargo area in its recently redesigned rear. Finally, Brady Blaine, Vice President of Pep Stations, elaborated on their goal to supply America with an electric vehicle charging infrastructure. This is obviously easier said than done, but the premise is simple. PEP (Plug-in Electric Power) has designed a simple charging station they hope to sell to malls, rest centers, gyms, and everywhere else people park their cars. Patrons can park their electric cars, charge up in 1 to 5 hours, and drive away with a full battery. In summary, the EV press conference characterized how the electric vehicle industry is slowly making its way to the mainstream. Cars like the i-MiEV, Think City, and Nissan Leaf are practically designed, have ample cargo space, and have more than enough range for 90% of Americans. These cars will be on our roads, in our showrooms, and charging in our garages within the next year. 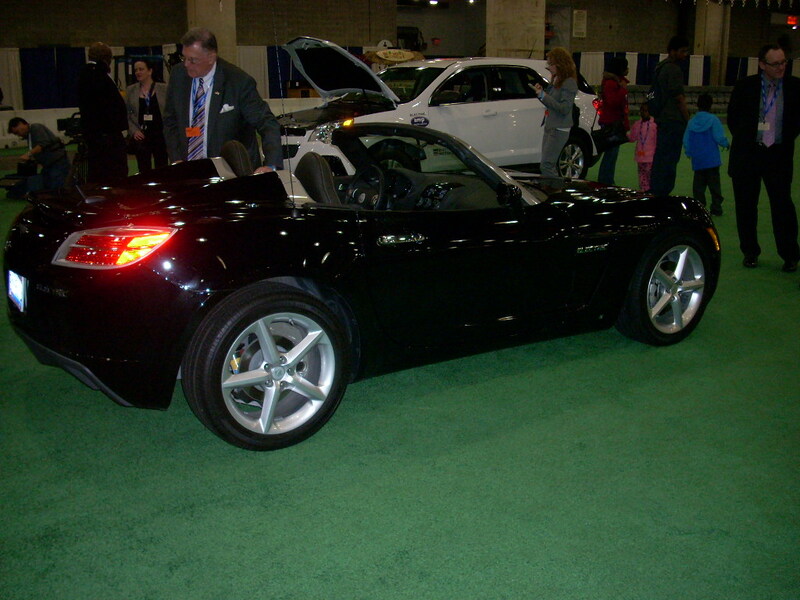 The concept cars of two years ago are finally becoming a reality, and I was thankful to see and drive them at the 2010 New York Auto Show.